Hutch clean performs to the “Hospital B” standards of disinfection. Regular use will maintain a high level of hygiene in the animal environment, providing antiviral, antifungal and antibacterial protection. Hutch clean can be used for disinfection of food and water containers, toys, cages, grooming equipment and bedding. The fresh lemon scent also helps to combat unwanted pet odours in the home. 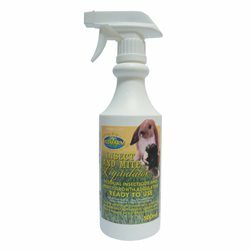 Recommended for: Use as a safe and effective disinfectant cleanser for all situations that require a high level of hygiene, such as hutches, hospital cages and for disinfection of equipment.